There are many actors from the Tamil film industry who have managed to dominate around the globe. Yes, they are popular not just in India but even abroad. And one such actor is Vikram, who is fondly called as Chiyaan Vikram. Today (April 17), the Kollywood star has turned a year older. He’s celebrating his 53rd birthday, but he is the young and dashing superstar for everyone. The way he has established himself in the world of showbiz, is appreciated by everyone. Chiyaan Vikram Records a Song for Kadaram Kondan, Composed by Ghibran – See Pics. For those who don’t know, Vikram appeared in short films and also did few commercials just to get spotted by any casting directors. To reach this height of success, the journey that he had to go through, wasn’t easy at all. In the initial phase of his acting career, the man has seen his films going for a toss at the ticket windows. He switched industries, but even that did not help Chiyaan Vikram to get a breakthrough like many others did. Vikram’s first feature film En Kadhal Kanmani happened in 1990. It took almost a decade for him to get his first box office hit film. It was Sethu that released in 1999 changed everything for Vikram. Let’s take a look at such five best films of Vikram that turned out to be memorable for the superstar. Kadaram Kondan Teaser: Chiyaan Vikram Looks Damn Stylish in This Kamal Haasan Production – Watch Video. Sethu was a directorial debut of Bala and it turned out to be a huge hit not just for the filmmaker but it gave Vikram a breakthrough. The actor was in dire need for recognition and that’s when the romantic drama Sethu happened. It is considered to be a cult film, in which Vikram essays the role of a college student who suffers a brain injury. After Sethu, actor Vikram who had just back-to-back flops, rose to prominence and was landed with amazing projects. In 2001 he worked with Dharani for the film Dhill which was a box-office success. In this action movie, Vikram played an aspiring policeman and audience loved his role. Vikram who started to deliver box-office hit films, then started taking up masala entertainers. He was seen as an action hero in Gemini that hit the screens in 2002. For those who don’t know, this gangster drama directed by Saran grossed Rs. 100 million at the ticket windows. Vikram had gained immense stardom by then but he had no airs about it. He went to play the role of Aarusaamy, a crooked cop in the action-entertainer, Saamy. His not-so-honest avatar was liked by viewers and again turned out to be the best films of 2003. After four years of Sethu, Vikram and director Bala reunited for Pithamagan. It was all together a totally different role that Vikram had given a nod for, a character that was never seen before in Kollywood. Nobody besides Vikram could have pulled off the character Chitan so beautifully. Be it a love story, action-drama or any masala entertainer, Chiyaan Vikram has given his best to attain the position where he is today. In 2010 the actor made his Bollywood debut with Mani Ratnam’s Raavan. It took a decade, but his efforts was recognized eventually. 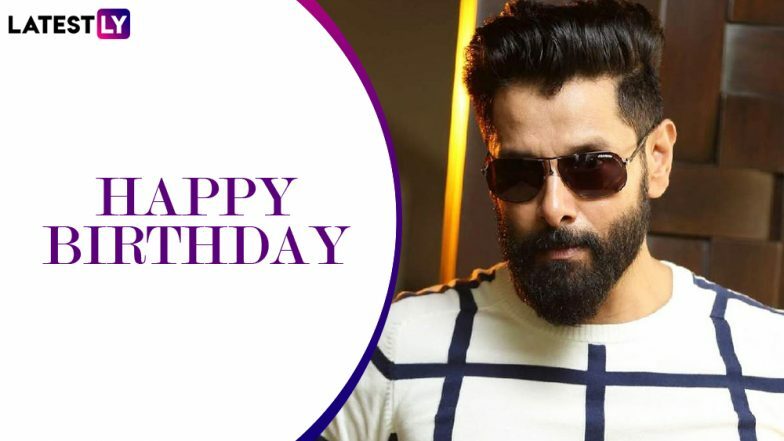 The projects on which he is working currently include Dhruva Natchathiram, Mahavir Karna and Kadaram Kondan (realeasing on April 19). We wish Vikram a very happy birthday, all the love and luck for his future endeavors. Vikram Prabhu, Karthi, Aishwarya Rai Bachchan, Keerthy Suresh Come Together for Mani Ratnam’s Ponniyin Selvan?